Bund China Equity Europe PMI Treasury Big Trouble in Little China .. (and at least a cold in Europe)? Big Trouble in Little China .. (and at least a cold in Europe)? 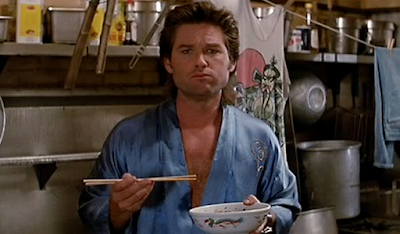 Here at the Jack Burton School of TradingTM we are wondering if the market is missing a piece of information or if is, at least, underestimating a risk. Looking at the Treasuries yield going lower? Or maybe the Bund? What if the recent price action (today in particular) is not driven by US "political" battles, but by China? “I have a very positive attitude about this”: common feeling among many market participants. Most of the Street is looking at China as not much of a problem, at least until fall. What we fear is that China is slowing down (as some data is showing) and the slowdown is already enough to create problems for the rest of the world, especially where the effect of the wall of liquidity/credit impulse/investments coming out of China has been stronger. What have you been drinking?? Let`s try to put pieces together (apart from the obvious ones such as Chinese stocks), to name a few: Commodities, Canadian real estate, Australian real estate. We see them as some sort of canary in a coal mine (We can`t really count on Japanese stocks as BOJ has been buying them like crazy). 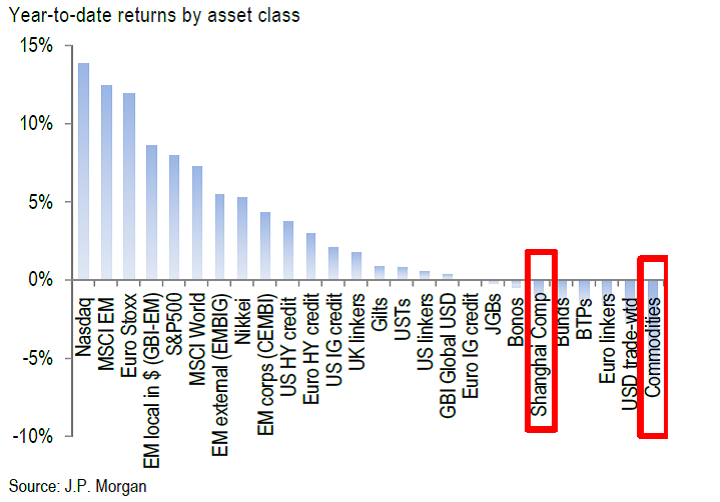 To confirm that China is indeed the problem we would monitor price action in European assets. If they start (or keep) under-performing US assets, we think what looks like a potential fade now, will have the capability to transform itself into something bigger. Given how European risky assets have performed since the beginning of the year and how consensus that view is now, we think European equities could be in for a bad surprise and another consensus trade, Italian BTPs, could become a bitter pill to swallow for those who recently closed their shorts after the French elections (if we are looking in the right direction=East). Europe's growth is heavily dependent on China (exports to China & HK % GDP (20163Q): Germany 2.5%, Europe 1.3%, not to mention investments) and if something is truly happening there we will feel it in this part of the Old World. BTP could still go up at the beginning as Rates are bid and the market might discount a more dovish ECB, but we don't believe it could go up much more from here. In our humble opinion the ECB would step in only after a proper risk off move, which at a certain point (as in February 2016) would drive BTP lower. Moreover, the market is not pricing anymore the risk of early elections in Italy (look this space..and don`t forget the banking system!). “It`s all in the reflexes”. Agree that China is key to global risk rally, but my latest read is positive. PBOC finally stepped with liquidity a couple days ago, and thermal coal, iron ore, and steel futures all seem to have stabilized or started going up. I'd watch those. Re Brazil, I am no expert. I'd avoided BRL because appreciation seemed capped and everything hinged on Temer not getting caught up in the corruption probe. Now that he is, it's looking very dicey. The prospect of stabilizing the fiscal situation with reforms underpinned the Brazilian markets. It was and is key. Problem is these reforms are politically hard to sell to an electorate, so you need them done by a President elected by the sitting congress. As things were, the markets were turning a blind eye to a material watering down of the pension reform. Now that pension reform may be dead, all together. What I think you need to see here is Temer step down and a credible replacement agreed by the coalition. Elections aren't until later in 2018, so there's still time to replace Temer and get the reforms done. If you end up with early elections here, the Brazil story is potentially finished. Luckily took off my delta-one exposure to USDTRY yesterday but put back on at spot=3.62. Then Erdogan goes on the tape: "what has emergency rule obstructed for businessmen?" Moron. Getting run-over. Re-shorted buxl earlier today. Maybe too early for this. Working, but we'll see. My guess is gold is a short here. @johno, I'm buying your Gold right here! Exits: 1340, 1380, 1440, 1480. Hard to know if we are in EM RISK-OFF buy the dollar (Brazil) or US RISK-OFF sell the dollar (Trump). Suggest we sit and wait out the weekend while perusing all available charts. Temer isn't resigning => no quick resolution => I'm not touching Brazil. May 18, 2017 at 9:28 PM × This comment has been removed by the author. Speaking of China, is this an echo of Japan in 1986 or the conglomerate mania in 1968, where it was believed that it was a good idea to purchase unrelated companies as long as your company had a higher p/e than the target (the premise being that the p/e of the combined company would maintain the acquirer's p/e, thus increasing the value of the purchase). As I recall, neither of those situations ended well. Traded 564 VIX futures today. Pretty sure that is the most I have ever done (and a reasonable number for a little retail guy). Confident that Harry would not make an appearance yesterday, but now I am wondering who shows up first - Harry or Nico. Probably depends on the path forward. If there is more carnage, I do hope that Nico shows up to call the bottom (the past timings of his "covering my shorts" posts have been pretty much spot on at the nadir). @eruditetroll, I don't know if those two traders are coming back to help us out with calling a bottom. I think they may be tired of noise and are resting by the beach. But I do think the bottom is not near yet. I look at some monthly charts that are so overextended they make yesterday's pullback looks like a blip on the radar. Pull up pretty much any NDX high-flyer tech. These charts either need a reset or another planet to occupy. I believe that big money is hiding there and may be ready to flee. Why are you guys talking about a bottom when all that has taken place is a tiny 2% sell off from record high territory? The bottom is likely far far away. Use metrics like % of stocks in the index trading under the 200 DMA as a good indication of a bottom. "Why are you guys talking about a bottom when all that has taken place is a tiny 2% sell off from record high territory? " I would guess because expiry week as promised so much so many times before and failed to deliver following on from that week. Could this time be different. Sure it could ,but we have been here before many times have we not. Guess the answer gets delivered between now and the end of the month which as a trading statement is of little help whatsoever other than as an indication that sitting on one's hands might not be a bad thing to do. On Oil, in the spirit of 'managing expectations' does anyone (IPA?) have a counter for a case going short oil for over the OPEC meeting? There was the big move up after the Nov 30th meeting, then the additional gap higher Dec 12th, but the price hasn't really been higher than the level reached that day. To recap, Nov 30th was for 1.2M bpd cut, Dec 12th was non opec joining in for another ~550k bpd. Of the three options, 1) cancel output cuts, 2) do nothing (ie maintain current reduction), and 3) increase production cuts, which is most likely, already expected and to a similar extent priced in? I think the consensus seems option 2 will be the outcome. Is that case therefore not already priced in? Crude inventories haven't surprised in a bullish sense, while product inventories are increasing, limited future demand. I think potential upside based on either OPEC or demand is capped here, i'll be short July future. @Rain, I sold 1/3 of my long WTI position here at 50 but still have another third left for 52 target. I will assess the situation at the top of the range but have no current plans to short up there yet. If I decided to short there would have to be a technical reason for it like price reversing on high volume and/or major support levels breached on daily consecutive basis. I'll post them here as I enter/exit. If you put a gun to my head I would say crude is going up in a steady upclimb into the end of the year from here on. Rain -- the US is the lowest cost storage in the world. That means inventories go down last here. The bullish surprise is yet to come in US inventories. When it does, oil goes to mid-to-high 50s. That, at least, is my framework. At these levels, I'm sitting tight with call spreads and KO calls, and of course, short EURNOK, which is cheap-to-oil but requires patience. A few of us predicted a bounce in spoos into expiration and here we are at about the 61.8% retrace of Wednesday's drop, with the bounce in QQQs a little better. Gap/s not yet filled. This might be a decent short set up by the end of the day if we hold around here going into next week. Some think it may be revealing that the bounce in small caps, IWM, and in the 10y yield are significantly smaller than that in the spoos and Qs, with VIX not yet returning to single digits, until perhaps this afternoon. Palladium views? Car sales look toppy in the US and China, speculative length is high, and chart people might see some kind of wedgie thingy there. Not much comment on DXY here given that it's broken the 98 level every chart guy thinks is crucial. Big buy-the-dip day in Brazil. Not biting. I still remember how (and why) people viewed this country in 2015. Without pension reform (that probably only this congress could get passed), the country's finances are doomed. Counter-view? "Five different Senate and House committees — including both congressional intelligence committees — are running inquiries into the Russian meddling. But the special counsel, Robert S. Mueller III, who was appointed on Wednesday, is widely expected to ask Congress to scale back public hearings with witnesses who might be integral to his investigation.... Mr. Rosenstein also affirmed that the Justice Department’s inquiry was focused on possible crimes, meaning that potential subjects of investigation would almost certainly refuse to testify before Congress or withhold documents from lawmakers for fear of possible prosecution." That nicely articulates why I added some risk after the special prosecutor announcement (though I should have bought e-minis too). Bounce seems to have failed for the time being, most clearly in IWM. We have a small short in IWM, now that this chart action looks consistent with a trend change, at least for the immediate future. Fairly boring day in bond land. Yields certainly didn't spring back…. have a good weekend, all. Leftback, agree with your assessment of US equities here. It was a nice bounce for those who missed the wake up call with a chance to unload into opex. I have GTC order on NQ short @ 5688 with a stop just above the high - 40 point risk with 240, 300, and 370 point reward. Hopping to get filled sometime on Monday after everyone cheers no bad news over the weekend and then gets surprised with a mid-day selloff into the strength. Seems like you're looking for a reason to justify a China blow up theory (the bodies of thousands of US and European traders over the last 30 years there - "uh yeah, China's a bubble") but you've not even bothered to look at HSI or HSCEI? and you liked what you saw, and you're looking for reasons post-hoc? * I like to recall having dinner in Tokyo with a certain Head of Department from LEH in Aug 2008: "It's unbelievable that ICBC has a larger market cap than Citi. It's definitely a bubble". For those with bad memories or too young, a couple of months LEH blows and my dinner date is getting a package, and soon after that C gets bailed out and shareholders have blue chip toilet paper. Brl is capped in my view, unless you get broad dollar strength. Even if temer leaves. But for sure it could go more before we stop. Hard to say if all that is in the price just yet. Itau did sell off 20% for some lucky dip buyers. Will have to watch CDS spreads and interest rate expectations. So s&p filled the French election gap. Back to la la land. Bitcoin near $2000 now. My guess is that googl and Amzn need to hit $1000 before this is over. But Iwm is the tell. 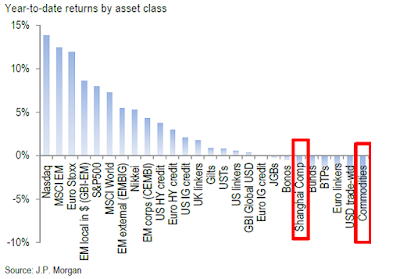 On China, so far it's only been correct to play China cycle via commodities. Everything else is more complicated. China is slowing not blowing up. Big difference. Global markets only panic when they think China is blowing up. Otherwise it's a process. We are still enjoying the stimulus of last year imo. But I'll be watching em leaders like kospi. Though as I said before its so much about tech these days. Em is a tech driven index now along with US. IPA I didn't buy Aeo but damn interested now. Pretty good mgmt team and good returns on capital. They are not losing to competitior imo. Just tough retail environment. Might pair it up. Re rain, johno and oil. A lot is in the price. U.S. Energy equity can't find a bottom. Hard to be bullish until they do. I'm holding here but starting to get worried. If risk markets sell off I'm out. If oil is weak bc demand isn't what it's supposed to be, and we have to wait for market to factor that in, could be a lot lower fast. I'm not there yet but thinking ahead. Estimated demand is near highs and I don't think too many ppl have any downside factored in. Just a thought. I dunno abee, teen apparel does not strike me as a viable option going forward. Things in retail are unfolding fast now. Pretty sure someone can copy Aerie's model, unleash a Snapchat/Instagram advertising campaign and become a formidable competitor catching them by surprise. Once that happens, AEO is a single digit stock with very little left to spare. I look at bankruptcies in that space and it makes me cringe. Why am I going to invest in a stock about to go into single digits and no support on the chart as of yet? Risky proposition in the environment you correctly pointed out - very tough. It would completely contradict my XRT short, even if I was to pair it, which I can't see myself doing after AEO's report this week. Teens are a finicky bunch to sell to. My daughter said she does not like Aerie, but she has always been a VS girl. More importantly, I think the carnage in shoe biz is a telling sign. I look at Payless bankruptcy, DSW, FINL and FL stocks and they are telling me that ladies are buying a whole lot less shoes at brick-and-mortar and men are not excited about sneakers for some reason. I say NKE 49/50 support breaks and sends shock waves through the market and engulfs retail for sure. Scary times ahead. XRT target 35. One stock I think could be a real loser is ULTA. I am watching their chart like a hawk. Yes, playing with fire, going against a cult. But if ladies can buy shoes online they can certainly buy their cosmetics and body lotions there as well. The nut case analysts are going crazy over the stock which is in the thick of a vulnerable retail market and a company that expanded rapidly and has a huge exposure to slowing foot traffic at shopping centers. What could go wrong? Some things just don't add up today. Not trying to talk my book but... Gold is up along with stocks, oil svc stocks are down while crude is up, all defense stocks hit a wall at the open, 10-yr is just meh while equities are ripping and commodity currencies are not ripping. I am adding to my CAD short here. I am short NQ here. I am not crazy about this rally, I think it runs out of steam this pm or tomorrow in am. Ah bless those duvet days. How about that silver/gold spread trade today? Trump it seems is not as unloved abroad as he is at h... Nah he is,but when you're a messenger, it is polite to listen. Oil reached it objective earlier today. Could there be a possible flaw in the thinking that WMT is going to benefit from specialty retailers and other big boxes shutting down their stores? I have to imagine the demand is not there vs the demand shifts to WMT. I read quite a few analysts pounding the table on WMT and I have to disagree. Many of these closing stores cater to a very different consumer. I don't see how WMT gains a lot of their biz, and if anything, the biz is simply shifted online or is not there any more. Clothing/shoes, electronics, gaming - they are all shifting online. Not a single doubt in my mind that WMT does not come up as the top consumer choice for shopping those items online. Nor can they compete on the item they simply don't carry in stock. WMT carries cheap crap that breaks a lot - a reputation they have garnered over many years and not one to be changed quickly enough to capitalize on this retail debacle. I think that resistance @ $80 holds and price goes down to test $60. Using puts to play this trade. Bitcoin land is going insane. Smaller crypto currencies doubling in a week. Em tech very strong. Sold my last part of tencent. Good comapny. Crowded trade. Xle vs oil here is giving me a pause. They've been selling 50 dsma on XLE and XOP since the end of Jan. One day (pretty soon) that trade will stop working and both will blow through and keep on going. I am holding onto both and will add more on that possible breakout. Inverted head and shoulders here as well. Just wanted to stop by and thank you guys for shorting spooz (and equivalents) thus helping to drive prices higher. Please continue to do so as we push through All Time Highs. Thanks guys! Yes HH, we know, all money went from our accounts to yours. Congrats! Based on your appearance equities should top today by noon US eastern time. Now, STFU! So WTI doing the dance way north of 50 may be an indication that quite a few wanted to buy the pullback but instead will be forced to chase. It is looking to go higher still and is only 15c below YH here as I type. I rolled into N last week and have a skin in the game, so talking my book. It's a 30c adjustment from M so my exit target is 52.30 and that is about where the trendline resistance (2/21 & 4/12 touches) comes in. OPEC meeting is a risk, I'd like to be out by then. Only 1/3 position left. Lot more believable HH if you could keep your storyline straight. Last time of asking your positions had banked and you were bored waiting for something to happen. Like most liars Harry you trip yourself up by assuming everybodyelse shares your lack of attention to detail. Mummy must be calling you by now. Surely diaper changing is due. Pulled the trigger on ULTA short. 10 dollar risk vs 70 dollar reward. Look at DSW today, ouch! Not the same specialty but caters to the same consumer. Auto parts retailers, that is. 55 pip slap on the wrist on my CAD short. BOC is a bit optimistic here, I don't want to fight them. Using the weakness in Canadian banks this am to cover my leftover shorts in them. Stepping aside to let this confusion figure itself out while my attention is totally consumed by US retail train wreck. Win some, lose some. Nice bets in retail, IPA. DIY auto retailer short basket now -15% since inception. Covered a Canadian lender short at about -15% too. Shorted palladium on yesterday's bounce, leaving me long aluminum short palladium in metals. In oil, recently added a curve flattener, but small as entry is late-to-the-game. Still long through call spread and KO call too. In FX, exited TRYZAR Friday on concerns over the the constitutional court giving Mbete discretion to hold a secret no confidence vote. Zuma may be forced to step down to rpevent a split vote by the ANC. Or maybe Mbete hands off the decision to committee, giving Zuma more time. Too binary. Annoyingly put this on in high-3.70s when i-banks all went bullish. Mistake. Took off some of my EURUSD fly yesterday that mentioned here before. 5x payoff. I'm not especially bullish EURUSD here. Looks expensive on models. Also covered buxl two days ago. Unconvinced Draghi will give us more than a "balanced risks" statement in June. Large position short USDMYR working. Regulatory catalyst discussed here before. One of those trades you can do if you don't need 100s of millions of liquidity (but are big enough to have access to NDFs). NOK continues to test my patience. Worse, it kept me from going long CAD. I probably agree with bearish thesis on Canada, but thought too slow-moving a process to short CAD when OPEC was right ahead and the currency was quite cheap to oil/rates. Will be interesting to see if I get schooled in this NOK. May 24, 2017 at 9:19 PM × This comment has been removed by the author. IPA, great call on auto parts retailers. I have no positions on those , I have instead shorted part makers with very concentrated set of clients like AXL and MRE , on the rationale that they will suffer as auto makers cut production to deal with inventory build up and lower sales. Also on retail , still short XRT even though I did buy half on the recent move back to 44 at 42.5. Got fooled by the noise but confident it will go to 35 now. Yesterday there was a Demark sequential buy so we may have a opportunity to add to position soon. Also added FCX here, tracks iron ore very closely and historically buying iron ore after such a steep drop works pretty well, as the chinese manage to contain it, at least for now. 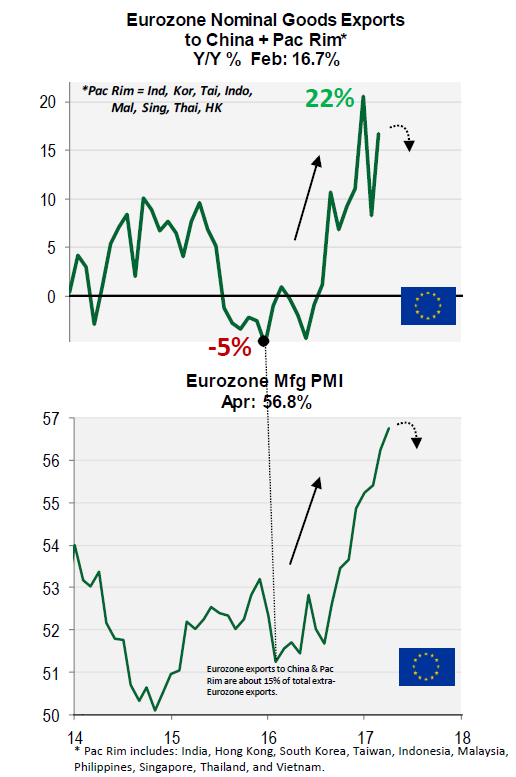 On Europe, confident that economic green shoots will quickly disappear and that it will follow US eco cycle as usual. So far things have been going the other way but fortunately played it by going long euribor and not short eur so I'm scraping a profit. dfdsfiol, thank for the link. Being early was the key. Letting Canadian banks retrace a bit before shorting them again. Also, it looks like BOC is talking up the CAD and trying to calm the market down. Sounds familiar? Ben did the same until there was no one left to listen. I am sure the snowball effect is what's in the back of their mind. MacroWatcher, I have a lot of respect for traders who were much earlier than me on this auto parts trade. It is a train wreck with no relief in sight. Not sure how these companies will operate in the environment where the incremental sales are gone, both commercial and residential fleets become disposable bunch of junk, and there may even be an increasing tax burden for those who want to keep multiple cars on their driveway, as the tax per vehicle will rise significantly when gov't becomes clever on how to generate more tax revenue per vehicle while the new auto SAAR craters. Tough times ahead for them, no doubt. On FCX. I made a lot of money on the stock last year. I let it all go into two weeks of post-election madness. I am not following it at all right now but wish you all the luck. Watch $12, huge support/resistance level. I am sure you already know this. If you are into iron ore look at CLF as well. Needs to find a bottom first. I am stopped out of NQ short and will reassess my view on the next breakdown (if one ever comes in this life). Don't like to short new highs, as there is nothing to hide the stop behind. HH, (in advance) STFU! Why short FCX on iron ore trade, play Value or FMG. Go direct, IMO. I like them both, but lower, not with China slowing still not 100% priced in imo. IPA i'm short ULTA too. But right now its just a play on earnings. Good luck. While Im not optimistic they will miss (since they are doing pretty well now) if they do you gotta be in before. In addition to the auto parts trade, do you have any thoughts on the used car market? Have been looking at Carmax and some of the lenders (mostly SC), but have not shorted yet. May 25, 2017 at 1:29 PM × This comment has been removed by the author.